The Wall Street gang must really be partying these days. Profits and bonuses are as high as ever as these super-rich takers were able to use trillions of dollars of below-market government loans to get themselves through the crisis they created. The rest of the country is still struggling with high unemployment, stagnant wages, underwater mortgages and hollowed out retirement accounts, but life is good again on Wall Street. Their world must have gotten even brighter last week when Attorney General Eric Holder told the Senate Judiciary Committee that the Justice Department may have to restrain its prosecutors in dealing with the big banks because it has to consider the possibility that a prosecution could lead to financial instability. Not only can the big banks count on taxpayer bailouts when they need them; it turns out that they can share profits with drug dealers with impunity. (The case immediately at hand involved money laundered for the Mexican drug cartel.) And who says that times are bad? It's hard to know where to begin with this one. First off, we should not assume that just because the Justice Department says it is concerned about financial instability that this is the real reason that they are not prosecuting a big bank. There is precedent for being less than honest about such issues. When Enron was about to collapse in 2002 as its illegal dealings became public, former Treasury Secretary Robert Rubin, who was at the time a top Citigroup executive, called a former aide at Treasury. He asked him to intervene with the bond-rating agencies to get them to delay downgrading Enron's debt. Citigroup owned several hundred million dollars in Enron debt at the time. If Rubin had gotten this delay, Citigroup would have been able to dump much of this debt on suckers before the price collapsed. The Treasury official refused. When the matter became public, Robert Rubin claimed that he was concerned about instability in financial markets. It is entirely possible that the reluctance to prosecute big banks represents the same sort of fear of financial instability as motivated Robert Rubin. In other words, it is a pretext that the Justice Department is using to justify its failure to prosecute powerful friends on Wall Street. In Washington this possibility can never be ruled out. 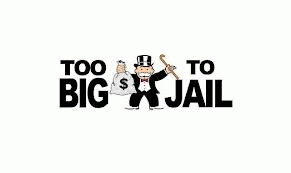 However, there is the possibility that the Justice Department really believes that prosecuting the criminal activities of Bank of America or JP Morgan could sink the economy. If this is true then it make the case for breaking up the big banks even more of a slam dunk since it takes the logic of too big to fail one step further. Just to remind everyone, the simple argument against too-big-to-fail is that it subsidizes risk-taking by large banks. In principle, when a bank or other company is engaged in a risky line of business those who are investing in the company or lending it money demand a higher rate of return in recognition of the risk. However, if they know that government will back up the bank if it gets into trouble then investors have little reason to properly evaluate the risk. This means that more money will flow to the TBTF bank since it knows it can undertake risky activities without paying the same interest rate as other companies that take on the same amount of risk. The result is that we have given the banks an incentive to engage in risky activity and a big subsidy to their top executives and creditors. If it turns out that we also give them a get-out-of-jail-free card when it comes to criminal activity then we are giving these banks an incentive to engage in criminal activity. There is a lot of money to be gained by assisting drug dealers and other nefarious types in laundering their money. In principle the laws are supposed to be structured to discourage banks from engaging in such behavior. But when the attorney general tells us that the laws cannot be fully enforced against the big banks he is saying that we are giving them incentive to break the law in the pursuit of profit. Our anti-trust laws are supposed to protect the country against companies whose size allows them inordinate market power. In principle, we would use anti-trust law to break up a phone company because its market dominance allowed it to charge us $10 a month too much on our cable. How could we not use anti-trust policy to break up a bank whose size allows it to profit from dealing with drug dealers and murderers with impunity?